Deposit at Carbon Poker and receive a 100% match on your first deposit up to $750. You earn 1 dollar of your bonus for every $5 paid in fees. When you earn $5 of your bonus, the cash will be moved from your bonus account to your real money account. Carbon Poker was established in 2005 and is licensed in Australia and runs on the Merge poker network. Support is available through e-mail, and LIVE Chat. Sign up and experience some of the best software available with features like Rabbit Hunting, Deal it Twice and Show 1 Card. Carbon Poker also offers a bad beat jackpot and good site traffic being part of the Merge network. Deposits are processed with great success rates by credit card. See below for a complete Carbon Poker Review. Carbon Poker is currently offering a 150% match sign up bonus up to $750. The Carbon Poker Bonus is released in $5 increments upon earning Comp Points. You must earn 375 Comp Points per $5 of the bonus to be released. Earn Comp Points by playing in tournaments or cash ring games. Earn 10 points for every $1 of rake generated in ring games, and 10 points for every $1 paid in tournament fee's. As part of your sign up bonus you are also eligible for 14 days of freerolls offered daily. 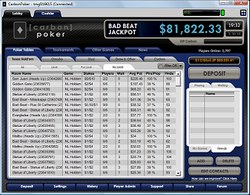 Carbon Poker has over $130,000 guaranteed in freerolls per month. Carbon Poker offers all variety of games including Fixed, Pot Limit and No Limit Texas Hold'em, Omaha, Omaha Hi/Lo, 7 Card Stud, 7 Card Stud Hi/Lo, 5 Card Draw and Razz. They offer a host of sit'n go and multi table tournaments. Sit'n Go's are offered as 1 on 1, 6 seated and 10 seated and with a variety of blind levels, and even ladies only tournaments. In sit'n go tournaments the blinds go up after every 10 hands. You can also create your own sit'n go tournaments here. Carbon Poker also offers Multi Table Tournaments, most at lower buy-ins and prize pools. The highest Guaranteed tournament is played on Sundays at 5 pm EST and has a Guaranteed prize pool of $50,000. They also offers a Bad Beat Jackpot and side games which include Blackjack, Roulette, Caribbean Stud and Video Poker. Carbon Poker offers Visa and Western Union as deposit methods. Credit Cards do work well, Carbon Poker has some of the best success rates of processing Credit Cards in the industry. Withdraws are offered by check. Site Traffic is fair to good being part of the Merge Network. Ring games can be found up to $4/$8 on NL Hold'em tables on a regular basis. During off peak times levels above this can be tough to find. 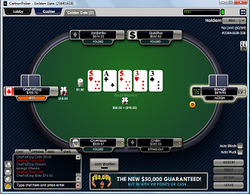 Tournaments can be found up to the $100 buy in level on a regular basis as well. Carbon Poker only offers customer support through e-mail which they state will be answered within 48 hours tops. During our poker review, we received responses between 1 hour and 7 hours with the majority of the responses very timely. As with most Internet Poker Sites, at lower levels the competition is relatively weak at Carbon Poker. As you progress up the blind levels at players tighten up a bit. When playing in freerolls, as the pots become bigger the competition becomes better as well. If playing in the monthly $50K freeroll, look for pretty good play as to play in this tourney you must earn 5000 Comp Points in a month which means the players are spending a decent amount of time on the site.